The Brewers ran their winning streak to 12 games Friday, topping the Dodgers 6-5 in Milwaukee in the National League Championship Series opener. Teams just aren’t supposed to win 12 games in a row in late September and October. The Brewers have, and they used the same recipe in NLCS Game 1 as they’ve used all season: The bullpen held a lead — although things got dicey near the end — and they got timely hitting. Among the biggest hits, and certainly the most surprising: A third-inning home run by Brandon Woodruff — yes, that’s right, one of the Brewers’ long relievers — that put Milwaukee on the board. That shocking blow set the stage for the Brewers to add another run in that inning, then three more in the fourth to go up 5-1. The Dodgers rallied for three runs in the eighth and another in the ninth but it wasn’t enough. Game 2 is Saturday in Milwaukee at 4:09 p.m. (ET). Craig Counsell’s management of his pitching staff in this NLCS is certain to spark speculation. The Brewers starters are solid if unspectacular; there is no true ace. On the other hand, the bullpen is almost unhittable at times. And Counsell is not afraid to use that pen, no matter how early. He showed that again in Game 1. After two innings from starter Gio Gonzalez (one hit, one earned run, on a homer by Manny Machado), Counsell called on his relievers. Brandon Woodruff came in and pitched two scoreless innings (oh, and he homered off Clayton Kershaw, a story his grandchildren will be sure to hear once or thrice). Then, with the Brewers holding a 5-1 lead, Josh Hader came in for the fifth inning. That is totally unorthodox, using arguably the most feared and unhittable reliever in baseball that early, with that big a lead, but Counsell plays by his own rules in managing this staff. 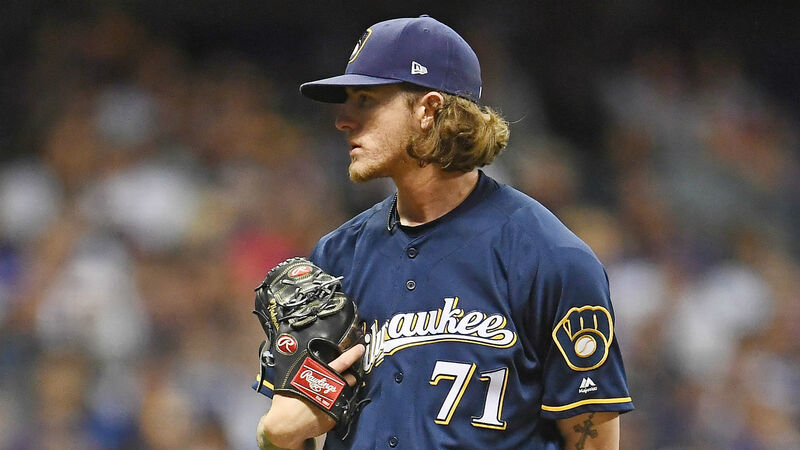 After Hader went through two easy scoreless innings, Counsell surprisingly brought him out for a third (Hader pitched more than two innings only four times in his 55 appearances this year). But the lefty got through another scoreless frame, striking out four and giving up only two hits in his stint. “He asked me if I was ready to go out for a third one, and I told him, ‘I’m ready, let’s go,'” Hader told FS1 after the game. Sticking Hader in for three innings in that situation was unusual. Counsell is lucky to have a weapon like that at his disposal. Use him the right way, he’s a genius. Bring him in too early, or overuse him, and Counsell will be fodder for sports talk radio the next day. So far, so good in the NLCS. With each passing day, the Brewers look almost destined to win the franchise’s first World Series in its 50-season history. The 12-game winning streak, many of them must-win games, is only part of the story. Christian Yelich will win the NL MVP in a walk. Brewers play-by-play announcer Bob Uecker is having the time of his life covering this team (how fun would that be to see the 84-year-old Uecker, the ultimate embodiment of the lovable loser, win a championship after years of hardship in Milwaukee). And the Brewers are the underdog anyone can root for, playing in the smallest market in baseball, with one of the smallest payrolls, yet competing with anyone. There are too many other subplots to mention, including the improbable front-office deals that built this franchise. If the Brewers go all the way and win the World Series, their story will make a great film someday — OK, at least an ESPN “30-for-30” type documentary. It’s fun watching it happen in real time. Clayton Kershaw is the greatest pitcher of this generation. He is now 8-8, with a 4.26 ERA, in 26 postseason games. Such a discrepancy makes no sense. The lefty labored Friday, lasting only three innings, charged with four earned runs on six hits and two walks. Kershaw’s fastball isn’t what it was 10, or even five years ago, but he’s still got that nasty hook and, usually, great control. But nothing worked for him against the Brewers. The 30-year-old veteran will get another start in this series, barring a Brewers’ sweep. That will give him plenty of time to ponder Friday’s disappointing outing and figure out what went wrong. When did the transfer window open, why was it early this summer and can both Premier League and EFL teams sign gamers?